Could Apple be making another "ugly" battery case for the iPhone XS? About 3 years ago, Apple launched its own battery case, called the Smart Battery Case, compatible with iPhone 6, iPhone 6s, and iPhone 7. The accessory drew a bit of controversy due to its looks — the battery was smaller than the case and located at the center of it, making for a weird and unsightly hump on there. 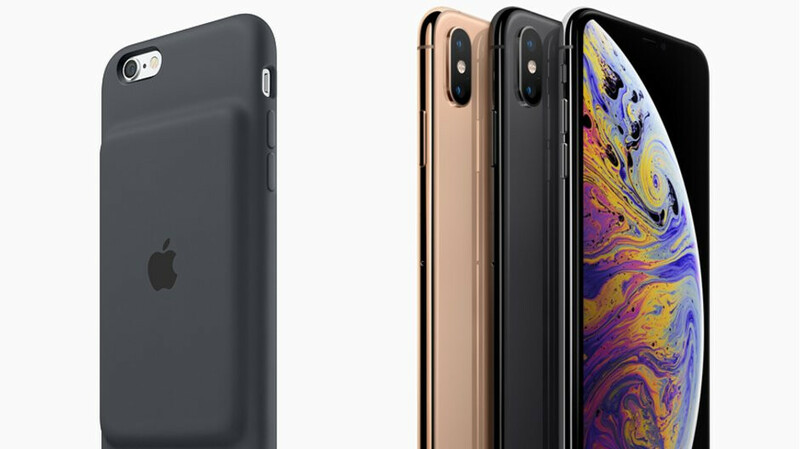 Granted, we'd say that quite a lot of the battery cases are inherently unsightly simply due to the fact that they need to actually house an external battery and connectors. Tim Cook talks about the iPhone 6s Smart Battery Case and its "hump"
Dec 10, 2015, 6:57 AM, by Paul K.
Dec 08, 2015, 9:38 AM, by Peter K.
The Smart Battery Case hasn't been updated since release, so there's no way to fit one on your iPhone X, iPhone XS, Max, or XR. So, are we going to see a second generation of Apple battery cases? According to an icon found in watchOS and posted about by 9to5Mac, yes we will. We can very clearly see that the new design has been made to fit the vertical camera module, found on the new generation of iPhones. Also, it does away with the ugly chin, so kudos for that! Is this kind of leak reliable? Well, an iOS beta element leaked the iPad Pro — with thin bezels, no notch, and no home button — way back in August. If Apple has a product made into an interface icon, it's pretty safe to say that said thing is about to hit the production lines if it hasn't already. Of course, the company can always pull the plug in the last minute, so don't take this as a 100% confirmation... but that Apple is seriously looking into it at least. Which phones will the battery case be compatible with? Our bets are on the iPhone X and iPhone XS. Apple seems to be holding out on accessories for the iPhone XR and, based on previous release history, it also doesn't feel like the Plus or Max models need their own battery case. Of course, we could be proven wrong, but that's our best guess. My battery last just fine, for a day. That’s why I don’t need fast charger nor 4000mah. If people don’t find its enough, then its time for them to get a life, not to look on their phone all the time and worrying battery’s status. A12 is battery effecient that lasts a day for regular users. This is about as dumb a statement as someone could make. "Oh someone doesnt use the phone like me, so they need to get a life" XS and XS max battery life are not great as is (good enough for most). If you have low signal its abysmal and you will not make it through a day without a top off (like most phones). Mine barely makes it through a day since i use it for work, would love to have 8 plus battery life on my xs max but it is much closer to the 8. I respect your honesty. I have a Max also, and it gets good battery life, even really good, but heavy use will tap it. I wonder why peaceboy comes here to lie, and try to start trouble with android users so much. Yeah standby time is damn good. Screen time not so much once you get it going. My note 9 gets slightly better times, my 6t smokes them all for battery life though. A X usually gets you through 6h of screen time, the xs should get you the same time, Max gives you an extra h. “Using the phone for work” usually means you have a 8h work day out of which 2h you get paid for doing your thing (lunch break, 5-10 min break time every h, you go pee, you sneeze, make a tea etc) so your work time is less than 6h/day, which means that with the Max you make it through the day just fine even when you do extra time, you put the phone on it’s charger and you go home. PS: unless you test games/apps on the iPhone (in which case you should be using more than 1 iPhone), you should ask your employer for a tablet, because 8h/day on a small display will f**k up your vision soon. Another very stupid statement by you, and I'm not surprised, cause you present yourself that way. I'm 100% sure, you said 4000mah as a jab to the Note 9. My Note has that capacity, cause it actually does a lot, and puts the battery to use. My Max...not so much. I use both, so I actually know, you just troll. I agree with Jedi here. I have both as well and the Note 9 is equivalent to a Diesel F250 does everything you throw at is and has endurance. The iPhone is more along the line of a Audi. Does quite a bit but doesn’t get the best MPG but it works so well you kind of don’t mind. Yeah. Spot on correct. Perfect examples. I am going to bet you don't even have a iphone. sissy246 which iPhone do you have? Then why is your favorite company making those battery covers? Ah, blame the user. Good little Apple fan. I couldn't believe he sat there, and justified Apple not including a fast charger or larger battery. Yes the Max has good battery life, but mostly for standby. When you use it heavily, it gets down there and may need topping off. Peaceboy has taken fanboying to a whole new level. Hm, interesting. I would be interested in something like this, as long as it isn't $200. I wouldn't use it all the time but just when I need it. I do wonder if it would be able to fast charge because from what I remember, the battery cases take a really long time to charge. Man those battery cases go hard af! I wish they made them for the max! I just wonder why would they need a connector when they could charge the phone wirelessly? !